"Host-versus-graft disease" redirects here. For the condition in which transplanted cells attack the recipient's cells, see Graft-versus-host disease. Micrograph showing lung transplant rejection. Lung biopsy. H&E stain. Though cytotoxic-crossmatch assay can predict rejection mediated by cellular immunity, genetic-expression tests specific to the organ type to be transplanted, for instance AlloMap Molecular Expression Testing, have a high negative predictive value. Transplanting only ABO-compatible grafts (matching blood groups between donor and recipient) helps prevent rejection mediated by humoral immunity. Because very young children (generally under 12 months, but often as old as 24 months) do not have a well-developed immune system, it is possible for them to receive organs from otherwise incompatible donors. This is known as ABO-incompatible (ABOi) transplantation. Graft survival and patient mortality is approximately the same between ABOi and ABO-compatible (ABOc) recipients. While focus has been on infant heart transplants, the principles generally apply to other forms of solid organ transplantation. The most important factors are that the recipient not have produced isohemagglutinins, and that they have low levels of T cell-independent antigens. UNOS regulations allow for ABOi transplantation in children under two years of age if isohemagglutinin titers are 1:4 or below, and if there is no matching ABOc recipient. Studies have shown that the period under which a recipient may undergo ABOi transplantation may be prolonged by exposure to nonself A and B antigens. Furthermore, should the recipient (for example, type B-positive with a type AB-positive graft) require eventual retransplantation, the recipient may receive a new organ of either blood type. Rejection is an adaptive immune response via cellular immunity (mediated by killer T cells inducing apoptosis of target cells) as well as humoral immunity (mediated by activated B cells secreting antibody molecules), though the action is joined by components of innate immune response (phagocytes and soluble immune proteins). Different types of transplanted tissues tend to favor different balances of rejection mechanisms. An animal's exposure to the antigens of a different member of the same or similar species is allostimulation, and the tissue is allogenic. Transplanted organs are often acquired from a cadaver (usually a host who had succumbed to trauma), whose tissues had already sustained ischemia or inflammation. Dendritic cells (DCs), which are the primary antigen-presenting cells (APCs), of the donor tissue migrate to the recipient's peripheral lymphoid tissue (lymphoid follicles and lymph nodes), and present the donor's self peptides to the recipient's lymphocytes (immune cells residing in lymphoid tissues). Lymphocytes include two classes that enact adaptive immunity, also called specific immunity. Lymphocytes of specific immunity T cells—including the subclasses helper T cells and killer T cells—and B cells. The recipient's helper T cells coordinate specific immunity directed at the donor's self peptides or at the donor's Major histocompatibility complex molecules, or at both. When memory helper T cells' CD4 receptors bind to the MHC class II molecules which are expressed on the surfaces of the target cells of the graft tissue, the memory helper T cells' T cell receptors (TCRs) can recognize their target antigen that is presented by the MHC class II molecules. The memory helper T cell subsequently produces clones that, as effector cells, secrete immune signalling molecules (cytokines) in approximately the cytokine balance that had prevailed at the memory helper T cell's priming to memorize the antigen. As the priming event in this instance occurred amid inflammation, the immune memory is pro-inflammatory. As a cell is indicated by the prefix cyto, a cytotoxic influence destroys the cell. Alloreactive killer T cells, also called cytotoxic T lymphocytes (CTLs), have CD8 receptors that dock to the transplanted tissue's MHC class I molecules,which display the donor's self peptides. (In the living donor, such presentation of self antigens helped maintain self tolerance.) Thereupon, the T cell receptors (TCRs) of the killer T cells recognize their matching epitope, and trigger the target cell's programmed cell death by apoptosis. Developed through an earlier primary exposure that primed specific immunity to the nonself antigen, a transplant recipient can have specific antibody crossreacting with the donor tissue upon the transplant event, a secondary exposure. This is typical after earlier mismatching among A/B/O blood types during blood transfusion. At this secondary exposure, these crossreactive antibody molecules interact with aspects of innate immunity—soluble immune proteins called complement and innate immune cells called phagocytes—which inflames and destroys the transplanted tissue. Secreted by an activated B cell, then called plasma cell, an antibody molecule is a soluble immunoglobulin (Ig) whose basic unit is shaped like the letter Y: the two arms are the Fab regions, while the single stalk is the Fc region. Each of the two tips of Fab region is the paratope, which binds a matching molecular sequence and its 3D shape (conformation), altogether called epitope, within the target antigen. The IgG's Fc region also enables opsonization by a phagocyte, a process by which the Fc receptor on the phagocyte—such as neutrophils in blood and macrophages in tissues—binds the antibody molecule's FC stalk, and the phagocyte exhibits enhanced uptake of the antigen, attached to the antibody molecule's Fab region. When the paratope of Ig class gamma (IgG) binds its matching epitope, IgG's Fc region conformationally shifts and can host a complement protein, initiating the complement cascade that terminates by punching a hole in a cell membrane. With many holes so punched, fluid rushes into the cell and ruptures it. Cell debris can be recognized as damage associated molecular patterns (DAMPs) by pattern recognition receptors (PRRs), such as Toll-like receptors (TLRs), on membranes of phagocytes, which thereupon secrete proinflammatory cytokines, recruiting more phagocytes to traffic to the area by sensing the concentration gradient of the secreted cytokines (chemotaxis). Initiated by preexisting humoral immunity, hyperacute rejection manifests within minutes after transplant, and if tissue is left implanted brings systemic inflammatory response syndrome. Of high risk in kidney transplants is rapid clumping, namely agglutination, of red blood cells (RBCs or erythrocytes), as an antibody molecule binds multiple target cells at once. While kidneys can routinely be obtained from human donors, most organs are in short supply leading to consideration of xenotransplants from other species. Pigs are especially likely sources for xenotransplants, chosen for the anatomical and physiological characteristics they share with humans. However, the sugar galactose-alpha-1,3-galactose (αGal) has been implicated as a major factor in hyperacute rejection in xenotransplantation. Unlike virtually all other mammals, humans and other primates do not make αGal, and in fact recognize it as an antigen. During transplantation, xenoreactive natural antibodies recognize αGal on the graft endothelium as an antigen, and the resulting complement-mediated immune response leads to a rejection of the transplant. Developing with formation of cellular immunity, acute rejection occurs to some degree in all transplants, except between identical twins, unless immunosuppression is achieved (usually through drugs). Acute rejection begins as early as one week after transplant, the risk being highest in the first three months, though it can occur months to years later. Highly vascular tissues such as kidney or liver often host the earliest signs—particularly at endothelial cells lining blood vessels—though it eventually occurs in roughly 10 to 30% of liver transplants, and 10 to 20% of kidney transplants. A single episode of acute rejection can be recognized and promptly treated, usually preventing organ failure, but recurrent episodes lead to chronic rejection. It is believed that the process of acute rejection is mediated by the cell mediated pathway, specifically by mononuclear macrophages and T-lymphocytes. 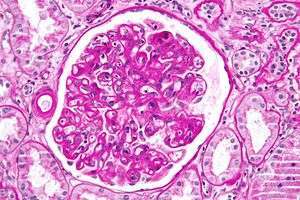 Micrograph showing a glomerulus with changes characteristic of a transplant glomerulopathy. Transplant glomerulopathy is considered a form of chronic antibody-mediated rejection. PAS stain. The term chronic rejection initially described long-term loss of function in transplanted organs via fibrosis of the transplanted tissue's blood vessels. This is now chronic allograft vasculopathy, however, leaving chronic rejection referring to rejection due to more patent aspects of immunity. Chronic rejection explains long-term morbidity in most lung-transplant recipients, the median survival roughly 4.7 years, about half the span versus other major organ transplants. 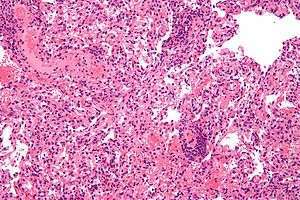 In histopathology the condition is bronchiolitis obliterans, which clinically presents as progressive airflow obstruction, often involving dyspnea and coughing, and the patient eventually succumbs to pulmonary insufficiency or secondary acute infection. Airflow obstruction not ascribable to other cause is labeled bronchiolitis obliterans syndrome (BOS), confirmed by a persistent drop—three or more weeks—in forced expiratory volume (FEV1) by at least 20%. BOS is seen in over 50% of lung-transplant recipients by 5 years, and in over 80% by ten years. First noted is infiltration by lymphocytes, followed by epithelial cell injury, then inflammatory lesions and recruitment of fibroblasts and myofibroblasts, which proliferate and secrete proteins forming scar tissue. Generally thought unpredictable, BOS progression varies widely: lung function may suddenly fall but stabilize for years, or rapidly progress to death within a few months. Risk factors include prior acute rejection episodes, gastroesophageal reflux disease, acute infections, particular age groups, HLA mis-matching, lymphocytic bronchiolitis, and graft dysfunction (e.g., airway ischemia). One principal reason for transplant rejection is non-adherence to prescribed immunosuppressant regimens. This is particularly the case with adolescent recipients, with non-adherence rates near 50% in some instances. Diagnosis of acute rejection relies on clinical data—patient signs and symptoms—but also calls on laboratory data such as tissue biopsy. The laboratory pathologist generally seeks three main histological signs: (1) infiltrating T cells, perhaps accompanied by infiltrating eosinophils, plasma cells, and neutrophils, particularly in telltale ratios, (2) structural compromise of tissue anatomy, varying by tissue type transplanted, and (3) injury to blood vessels. Tissue biopsy is restricted, however, by sampling limitations and risks/complications of the invasive procedure. Cellular magnetic resonance imaging (MRI) of immune cells radiolabeled in vivo might offer noninvasive testing. A short course of high-dose corticosteroids can be applied, and repeated. Triple therapy adds a calcineurin inhibitor and an anti-proliferative agent. Where calcineurin inhibitors or steroids are contraindicated, mTOR inhibitors are used. Cases refractory to immunosuppressive or antibody therapy are sometimes given blood transfusions—removing antibody molecules specific to the transplanted tissue. Bone marrow transplant can replace the transplant recipient's immune system with the donor's, and the recipient accepts the new organ without rejection. The marrow's hematopoietic stem cells—the reservoir of stem cells replenishing exhausted blood cells including white blood cells forming the immune system—must be of the individual who donated the organ or of an identical twin or a clone. There is a risk of graft-versus-host disease (GVHD), however, whereby mature lymphocytes entering with marrow recognize the new host tissues as foreign and destroy them. ↑ Frohn, C; Fricke, L; Puchta, JC; Kirchner, H (Feb 2001). "The effect of HLA-C matching on acute renal transplant rejection.". Nephrology, dialysis, transplantation : official publication of the European Dialysis and Transplant Association - European Renal Association. 16 (2): 355–60. doi:10.1093/ndt/16.2.355. PMID 11158412. 1 2 West, L. J. (2011). "ABO-incompatible hearts for infant transplantation". Current opinion in organ transplantation. 16 (5): 548–54. doi:10.1097/MOT.0b013e32834a97a5. PMID 21836514. ↑ Saczkowski, R; Dacey, C; Bernier, PL (Jun 2010). "Does ABO-incompatible and ABO-compatible neonatal heart transplant have equivalent survival?". Interactive cardiovascular and thoracic surgery. 10 (6): 1026–33. doi:10.1510/icvts.2009.229757. PMID 20308266. ↑ Burch, M; Aurora, P (Apr 2004). "Current status of paediatric heart, lung, and heart-lung transplantation". Archives of Disease in Childhood. 89 (4): 386–389. doi:10.1136/adc.2002.017186. PMC 1719883 . PMID 15033856. ↑ Almond, CS; Gauvreau, K; Thiagarajan, RR; Piercey, GE; Blume, ED; Smoot, LB; Fynn-Thompson, F; Singh, TP (May 4, 2010). "Impact of ABO-incompatible listing on wait-list outcomes among infants listed for heart transplantation in the United States: a propensity analysis". Circulation. 121 (17): 1926–33. doi:10.1161/CIRCULATIONAHA.109.885756. PMID 20404257. ↑ Fan, X; Ang, A; Pollock-Barziv, SM; Dipchand, AI; Ruiz, P; Wilson, G; Platt, JL; West, LJ (Nov 2004). "Donor-specific B-cell tolerance after ABO-incompatible infant heart transplantation". Nature Medicine. 10 (11): 1227–33. doi:10.1038/nm1126. PMID 15502841. ↑ Klymiuk, N; Aigner, B; Brem, G; Wolf, E (Mar 2010). "Genetic modification of pigs as organ donors for xenotransplantation". Molecular reproduction and development. 77 (3): 209–21. doi:10.1002/mrd.21127. PMID 19998476. ↑ Galili, U (Dec 2005). "The alpha-gal epitope and the anti-Gal antibody in xenotransplantation and in cancer immunotherapy". Immunology and cell biology. 83 (6): 674–86. doi:10.1111/j.1440-1711.2005.01366.x. PMID 16266320. ↑ Candinas, D; Adams, DH (Feb 2000). "Xenotransplantation: postponed by a millennium?". QJM : monthly journal of the Association of Physicians. 93 (2): 63–6. doi:10.1093/qjmed/93.2.63. PMID 10700475. ↑ Jaramillo, A; Fernández, FG; Kuo, EY; Trulock, EP; Patterson, GA; Mohanakumar, T (Feb 2005). "Immune mechanisms in the pathogenesis of bronchiolitis obliterans syndrome after lung transplantation". Pediatric transplantation. 9 (1): 84–93. doi:10.1111/j.1399-3046.2004.00270.x. PMID 15667618. ↑ Lau, CL; Patterson, GA (Nov 2003). "Current status of lung transplantation". The European respiratory journal. Supplement. 47: 57s–64s. PMID 14621118. ↑ Lama, VN; Murray, S; Lonigro, RJ; Toews, GB; Chang, A; Lau, C; Flint, A; Chan, KM; Martinez, FJ (Jun 1, 2007). "Course of FEV(1) after onset of bronchiolitis obliterans syndrome in lung transplant recipients". American Journal of Respiratory and Critical Care Medicine. 175 (11): 1192–8. doi:10.1164/rccm.200609-1344OC. PMC 1899272 . PMID 17347496. ↑ Nicod, LP (Jul 2006). "Mechanisms of airway obliteration after lung transplantation". Proceedings of the American Thoracic Society. 3 (5): 444–9. doi:10.1513/pats.200601-007AW. PMID 16799090. ↑ Belperio, JA; Weigt, SS; Fishbein, MC; Lynch JP, 3rd (Jan 15, 2009). "Chronic lung allograft rejection: mechanisms and therapy". Proceedings of the American Thoracic Society. 6 (1): 108–21. doi:10.1513/pats.200807-073GO. PMID 19131536. 1 2 Dobbels, F; Hames, A; Aujoulat, I; Heaton, N; Samyn, M (Feb 2012). "Should we retransplant a patient who is non-adherent? A literature review and critical reflection". Pediatric transplantation. 16 (1): 4–11. doi:10.1111/j.1399-3046.2011.01633.x. PMID 22248250. ↑ Hitchens, TK; Ye, Q; Eytan, DF; Janjic, JM; Ahrens, ET; Ho, C (Apr 2011). "19F MRI detection of acute allograft rejection with in vivo perfluorocarbon labeling of immune cells". Magnetic resonance in medicine : official journal of the Society of Magnetic Resonance in Medicine / Society of Magnetic Resonance in Medicine. 65 (4): 1144–53. doi:10.1002/mrm.22702. PMC 3135171 . PMID 21305593. ↑ Naesens, M (2014). "The Histology of Kidney Transplant Failure: A Long-Term Follow-Up Study". Transplantation. 98 (4): 427–435. doi:10.1097/TP.0000000000000183. PMID 25243513.